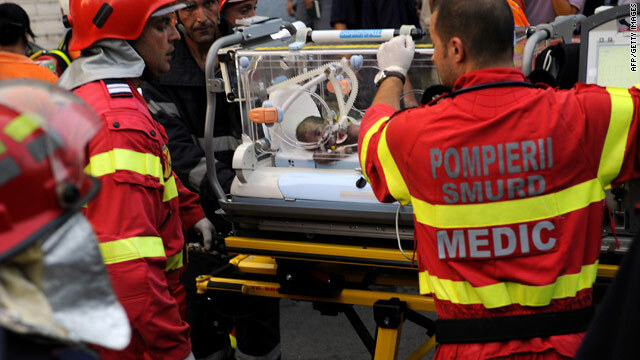 Rescuers tend to a newborn injured by a fire at the Giulesti Maternity Hospital in Bucharest, Romania, on Monday. Bucharest, Romania (CNN) -- Medical staff and parents frantically tried to enter a burning intensive care unit in a Romanian hospital to rescue 11 premature newborns, footage released Thursday by the government showed. Five babies -- two boys and three girls -- died in the blaze Monday at the Giulesti Maternity Hospital in Bucharest. The other six are struggling to survive. One was in critical condition Thursday and given minimum chances of survival, said Raluca Alexandru, a spokeswoman for Grigore Alexandrescu Children's Hospital, where the babies were being treated. The latest death was of a newborn who suffered burns over 75 percent of his body and died overnight, Alexandru said. The dramatic silent video released by the prosecutor's office showed people using a chair to break down automatic doors that could only be opened with a card that no one had at the time. Seconds later, the hallway filled with dense smoke. A firefighter spokesman said the video showed that hospital staff were not adequately trained in how to deal with a fire, though it is required by law, and did little to evacuate people from the burning building. The managers at Giulesti have been suspended until the investigation into the fire is completed, Bucharest Mayor Sorin Oprescu said Wednesday. An interim hospital manager has been appointed, he said. Investigators have so far questioned 25 people, among them hospital staff, guards and parents, prosecutor Marius Iacob said at a Thursday news conference. He said his office obtained footage from eight hospital cameras but only released the one because the others could affect the ongoing investigation. One of the videos, he said, showed when the nurse in charge left the intensive care unit. There are now at least 25 doctors taking constant care of the injured newborns, said Dr. Dan Enescu, director of Grigore Alexandrescu. Ten Israeli specialists arrived in Romania on Wednesday to offer their help in treating the babies, he said. The fire began Monday after an electrical cable in the air-conditioning system caught fire behind a wooden closet in the intensive care unit, according to prosecutors' preliminary conclusions. The cable had not been installed and isolated properly, they said. The fire also caused severe damage to the intensive care unit, burning incubators and other medical equipment. Prosecutors said the fire burned slowly for about an hour before any medical staff entered the room, which was supposed to be staffed at the time. They have now launched an investigation to find out why the nurse on duty was not in the room and why staff failed to evacuate the newborns. They are also talking to the specialists who worked on the air-conditioning system.